The weekly Shabbat Kiddush table is a place of blessing, schmoozing, and simcha (happiness). But it also has the tendency to generate a lot of waste, and unhealthy eating habits. The list below offers a few resources and ideas for making your kiddush table healthy and sustainable. The same ideas can easily be transferred to your next synagogue social event, Hadassah meeting, book club, or canned food drive. Thanks to Edith Stevenson of Vancouver, BC for her input on this list. Please continue to add your own ideas in the comments section. Start a kiddush committee at your synagogue. Get together a group of people who like to cook and give your usual caterer a break. Try offering a “homemade Kiddush” once/month where everything is cooked (not just taken out of boxes) by the volunteers and is mostly locally-sourced and organic. Use smart plates. If your synagogue does not have the resources to use reusable dishware on Shabbat, use post-consumer waste paper or plant-based ones. More info on this here. http://www.ecoproducts.com/ And use linen table cloths instead of paper or plastic ones. Go free range – Egg salad is a staple of the Kiddush table. Try making egg salad from cage-free eggs. Veggie cholent – Serve vegetarian cholent at your Kiddush. Try featuring a new grain like brown rice, barley, or millet. Feature seasonal fruits. Fresh fruit platters are commonly found at Kiddush tables, and are both beautiful and healthy. But if you live outside of California, it can be next to impossible to source these fruits locally during the winter months. Focus on fresh fruits when they’re in season – strawberries in June, melons in August, apples in October, root veggies in December. Try serving dried fruit or frozen fruit in winter. Read Anna Stevenson’s post on Jcarrot for more info. Skip the crème puffs. There’s nothing wrong with a little something sweet, and cookie platters are a great Kiddush table nibble. Try buying (or making) cookies made with organic ingredients and fair trade chocolate. Brands to try: Newman’s Organic Kosher Cookies – chocolate chip, mint crèmes, orange chocolate chip, Alphabet cookies…. Can the soda. Avoid sugary sodas and fruit punches – instead, serve seltzers, 100% real fruit juices (and scotch, of course!). A grape juice to try: If you live in the Northeaset, try serving the kosher grape juice from Glendale Farms – 607-546-8479. Keep it Fair. Congregations across the country are switching to Fair Trade coffee, tea, and chocolate! 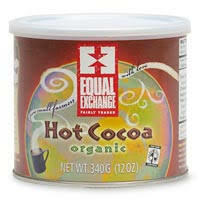 Equal Exchange offers an interfaith program where they specifically work to bring fair trade products to faith congregations. Family style. Try serving Kiddush family style – with the food on small platters on tables, rather than vast quantities at a long buffet. This allows people to see what’s available and encourages them to take healthy portions. The salatim. Try serving pickles, dilly beans, or other value-added products from local farms. Invite the farmers to speak to the congregation about their farm during Shabbat lunch. Educate. The most important thing you can do at a healthy, sustainable Kiddush is educate the people in your community. Make an announcement before Kiddush, and have table tents and resource sheets available explaining the important changes on the table. If a member of the community helped sponsor your healthy, sustainable Kiddush, don’t forget to raise a glass to them. L’chaim! Leftovers. “If you run out of food, or there is none left by the end of Kiddush, then the amounts were perfect,” Edith Stevenson comments. “The idea that we must have LOTS of food at a Kiddush is a Jewish tradition that I think is just plain wrong!” If you do have leftovers, consider donating them to a local Food Bank or other food recovery organization. No Replies to "Sustainable Kiddush – How to Host One"